Jack Gorman (26), is from Belfast, although he spent his formative years in the picturesque seaside town of Ballycastle. Since September this year, he’s been looking after the bar and – on a temporary basis – the restaurant at Robert McGregor’s bustling Mexican eatery, El Chapo, in south Belfast. Jack comes to the job with a healthy pedigree, having served his time behind a number of bars in busy venues across NI and around Europe in recent years. Throughout most of that time, he has also been studying, firstly, for a degree in music and more recently, for a second degree in law and French at Queen’s University Belfast. He’s currently combining his full-time post at El Chapo with his studies and admits that at times, he struggles to cope with the workload. It’s always been that way for Jack, though. From his earliest days in Ballycastle, when he lifted glasses at Tessie’s bar in North Street, he’s had academic aspirations. When he was 18, Jack left Ballycastle for the University of Gloucestershire where he launched into his musical studies. It wasn’t long, however, before he was back behind the bar, supplementing his income with a job at a Wetherspoon’s outlet in Cheltenham called The Moon Underwater. In his second year at Gloucester, he moved to a new job in the bar at the Students’ Union and in his final year, he was made assistant bar manager – his “first real management position”, he recalls. At the end of his time in Gloucester, Jack returned to NI and took a post as full-time bar manager at The Londonderry Arms in the Nine Glens village of Carnlough. Jack’s mother was a translator and during his childhood, he had travelled around quite a bit. For a time, he attended primary school in France and as a result, he speaks French well. During his time at Carnlough, he spotted an opportunity with a British company called Rude Chalets and went on to take a post at a bar, restaurant and nightclub venue in the French Alps. At 22, he was made supervisor of the nightclub element of the business. At that time, however, Jack was still primarily interested in academia and when he came back to NI in 2015, he was still convinced that this was where his future lay. Following a further stint abroad, where he worked in two Irish bars in Toulouse, France, Jack returned to NI in September and re-visited the site of the Birdcage which, he discovered, had been transformed into Mexican eatery, El Chapo by its new owner, Robert McGregor. He met Robert and pair hit it off fairly quickly. Robert invited Jack to come and work at his former haunt on a trial basis and he accepted. “I certainly see myself staying in hospitality, even after my degree,” he tells LCN. “I want to use what I am learning to get more into the business side of things. I’ve learned a lot from Robert, and I think I would like to own my own place, just not right now. Method: Muddle the kiwi in a shaker then add the other ingredients and dry shake, followed by a hard shake over ice. 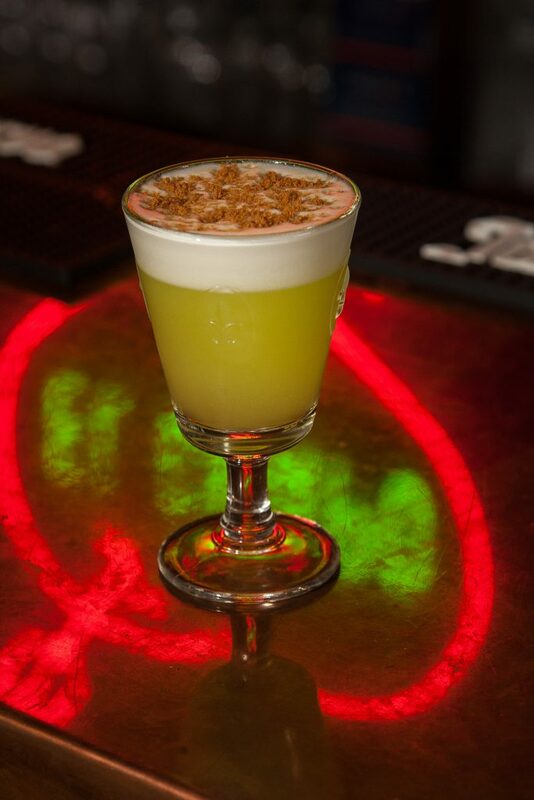 Fine strain into a chilled glass goblet and garnish with the crushed ginger nut biscuit.